At 392 sq ft, the Hideaway is the entry floor plan of the compact cabin range published by Satterwhite, but only one of many possibilities in this size class (yes, we will help you design your own). By comparison, the average motel room until recent years was about 350 sq ft. If Satterwhite were to develop a line of log cabin homes in the tiny house category, this would certainly fit. Even at this modest size, the Hideaway manages to include a kitchen, living area, bedroom, and bath, plus space for an over & under washer and dryer. 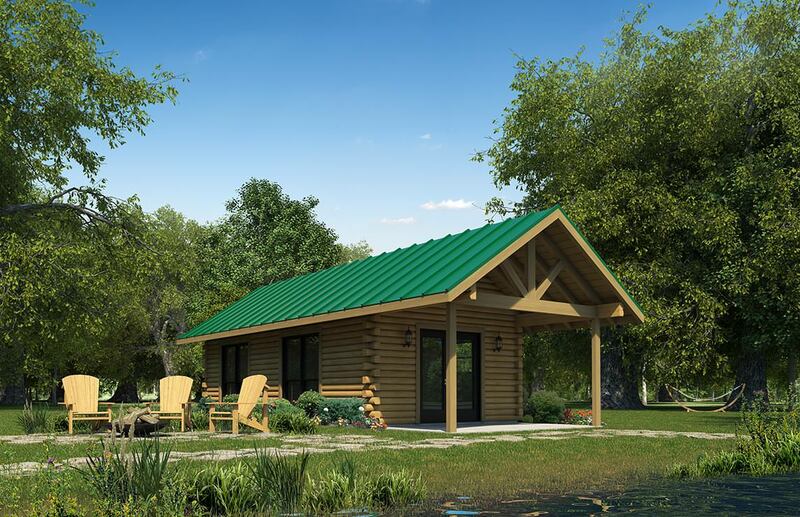 Depending on how you might finish the interior, it could serve as quarters for occasional use on family land, or even be adapted as a small guest cabin adjacent to a larger log home. We've also seen compact cabins of this size built in clusters to serve as freestanding lodgings in commercial applications such as bed and breakfast or motels, a great look in many settings. Why not?